What are the names of the planets in the Solar System? Which planet is surrounded by rings? Scroll down to see how many days they've been in space. What do astronauts eat in space? How could astronauts get to planet Mars? When can we see a full Moon? Where does the Solar System end? 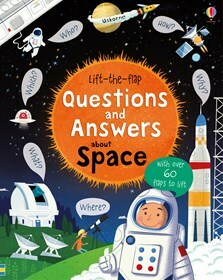 With over 60 flaps to lift, this delightful book answers questions such as “Where have people visited in space?”, “What’s a cosmonaut?”, “Why can’t I see stars in daytime?” and lots more what, where, how, why, and yes or no questions with answers beneath the flaps. Internet links take children to carefully selected websites to find out more. Fun, engaging , informative and, most important of all, built to last. A book which will appeal to young inquisitive minds. Along with the excellent content, the thick pages and sturdy flaps ensure that this is a book to last. The comic-style illustrations are great and the fun format means readers can dive into the book at any page and read answers to the questions that most interest them.